When blasting, according to regulations, a warning shout or sound signal must both precede and follow shooting. There must be a short blow prior to shooting and a long tone after blasting to warn, “danger is over”. For effective warning, Orica Mining Services offers both a mechanical and an electronic alternative. This is a very powerful compressed air driven siren with a sound intensity of 141 db(A). The Siren is delivered complete with mounting bracket, ½ ” coupling, reduction valve and a signal valve. We also maintain an inventory of spare parts. The ESS2 siren operates on 12 V DC. 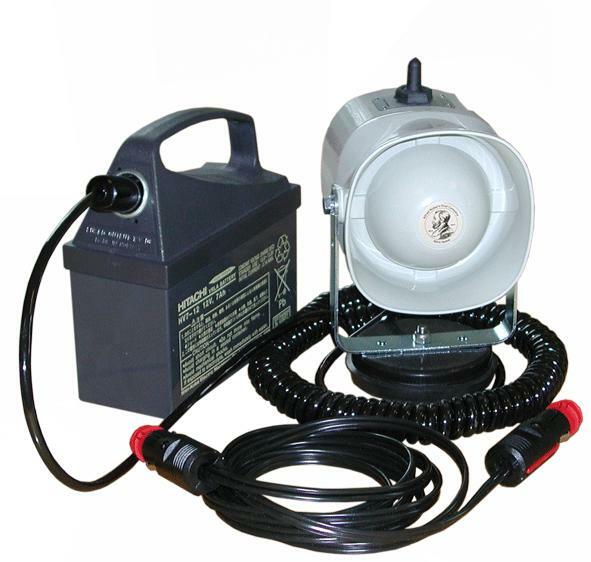 The siren can be connected directly to a power outlet (lighter) in a car or to a 12 V battery. The siren has a powerful magnetic base for fastening to, for example, a car roof. Power consumption is 1,5 A. Audio frequency is 2300 Hz, sound intensity is 127 db(A), and weight is 2,4 kg. Dimensions: 17 x 12 x 12 cm. A selector switch on top of the siren’s replay head controls short and long tones. The siren can be delivered complete with battery and a cord of approximately 2 meters with plugs for charging the battery.